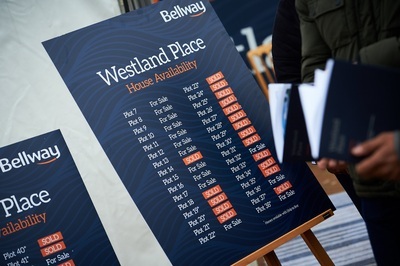 Home buyers in Essex were desperate to snap up one of Bellway’s new homes this month at the launch of Westland Place, with 31 properties sold on the day. The development released 46 homes in Rainham, on the outskirts of East London, with only 13 now remaining. 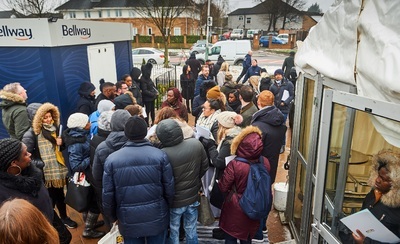 The event particularly piqued the interest of first-time buyers, with its superb location offering a commute into London of just 25 minutes. The popular development has only four apartments and nine houses remaining, available in a range of styles to appeal to young professionals and families. All properties incorporate modern design features, with open-plan living spaces, en suite shower rooms and integrated kitchen appliances. Many apartments include balconies, while all houses have gardens. Residents will also benefit from the convenience of allocated parking. The local area of Rainham has the benefit of a local Tesco less than a mile away from Westland Place for everyday essentials, as well as two other stores within a ten-minute walk. For shopping lovers, Lakeside Shopping Centre and Retail Park is also only 10 minutes away by car, offering over 100 large retailers and independent boutiques, a multi-screen cinema, cafés and restaurants. Ideal for commuters, Rainham Railway Station is only a three-minute drive, or nine-minute walk from Westland Place, offering direct journeys of just 24 minutes to London Fenchurch Street. There are also frequent services to Dagenham, Barking, and Limehouse. Major roads are easily accessible, including the A13 and the M25. For active residents, Rainham offers a wealth of open space. Spring Farm Park is a short walk from Westland Place, with an outdoor gym, sports pitches and courts, and a children’s play area. Hornchurch Country Park and Beam Valley Country Park in neighbouring Dagenham, and Rainham Marshes Royal Society for the Protection of Birds Nature Reserve are all 10 minutes away by car. Chafford Sports Complex is also less than one mile away, with two swimming pools, an exercise studio and a gym, or residents can get involved in the town’s archery, cricket or rugby clubs. Prices at Westland Place start from £239,995 for a one-bedroom apartment, £279,995 for a two-bedroom apartment and £379,995 for a three-bedroom house. For any further information please visit bellway.co.uk.